River cruising is a relaxing, immersive and thoroughly enjoyable form of travel where you can enjoy ever-changing scenery along the banks of waterways such as the Danube, Rhine, Seine, Douro, Volga and Yangtze. Unpack just once on an award-winning, state-of-the-art 190-guest Longship and journey into the very heart of iconic cities and charming towns. A form of leisure travel that takes guests along inland waterways. Usually there are several port stops over the course of each passage. Typical river cruises often last longer than a week. Carry anywhere from 100 to 250 guests, depending on the ship size. Are popular on many of the world’s major rivers, including the Danube, Rhine, Volga and Yangtze. The most cosmopolitan cities developed along the rivers, the world’s first trade routes. From iconic “must-sees” like Paris, Amsterdam and Budapest to quaint villages and towns waiting to be discovered, a river provides you easy access to savor the delights of both. Cities like Berlin, Lisbon, Prague, Vienna, Moscow, Cairo and Beijing are just a few that are accessible on a river cruise. In addition to the rivers listed above, cruises along lesser-known rivers like the Mekong in Southeast Asia and the Main in Germany are options. ACCOMMODATIONS. River cruises are brimming with onboard amenities. Stateroom are most often river-facing, and come equipped with hotel-style beds, private bathrooms, individual climate control, refrigerators, safes and TVs. Higher stateroom categories may have French balconies, verandas, and separate sleeping and sitting quarters. Rooms range from 150 to 600 square feet. Guests receive excellent and personalized service from on board staff. Additionally, ships include restaurants, lounges and bars, as well as free Wi-Fi. Some ships even come equipped with libraries, boutiques, pools and/or sun decks. 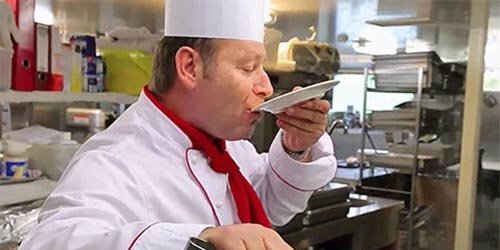 CUISINE. Guests are given a choice of dining options, including where and what to eat. Breakfasts can either be enjoyed al fresco or at the morning buffet, while lunches and dinners can be eaten while viewing passing sights or with friends in a common eating area. Open seating is offered, allowing guests to meet new people or enjoy the presence of the same people each day. Cruises offer regional cuisine and use locally sourced ingredients to help with their authenticity. Also common are wine pairings, selected from local tastes to help guests get a closer understanding of a region's culture. THINGS TO DO. River cruisers spend more time in the cities, towns and ports along the way. Included shore excursions consist of guided tours that help guests become well-acquainted with the culture, art and history of their destinations. In addition to guided tours, guests can roam freely around local stops or arrange optional shore excursions. There's always ample opportunity to find something to do in every port, whether it's visiting an ancient castle, attending a classical concert or enjoying a famous museum. While river cruises can be enjoyed by people of all ages, they generally appeal to people more advanced in age -- baby boomers, in particular. Many river cruise lines allow children aboard their ships, although they may have age restrictions in place and usually there isn't much for kids to do. The makeup of a liner can include people of a wide range of nationalities, but more often than not, guests come from English-speaking countries. Whether you choose to travel in the on-season or the off-season, you’ll be able to gain a deep cultural experience in each of your destinations. In the spring and summer, you may witness local outdoor events and lively activities that only occur during the warmer months of the year. Cooler weather in the fall may mean you’ll run into fewer people in the streets of cities and ports you visit, which will allow you to take your time and get a closer look at sites that interest you without feeling rushed or crowded. And in the winter season, you’ll be delighted by festive Christmas markets and enchanted by the holiday traditions and celebrations of the locals. Given that weather will be variable depending on where your river cruise takes you, bringing along both warm and light clothes is wise. Even during warm months, there is wind on the rivers, so it’s best to plan for layers even if the weather is hot. Additionally, you’ll likely be doing a lot of walking, so bring along comfortable shoes. Lastly, pack some dressier clothes in case you attend a formal event while visiting one of your cruise destinations. Although river cruises and ocean cruises share a number of similarities, there are also various—and considerable—differences between the two. For one, ocean liners are bigger and offer more stateroom accommodations on average. Appropriately, they’re able to host significantly more guests. The smaller scale of river ships means fewer guests, but more opportunities to get to know fellow travelers, which often lead to lifelong friendships. In contrast to ocean cruises that may include multiple sea days, you will rarely experience a full day of sailing on a river cruise. Typically, guests will awake each morning to find themselves in a new port. 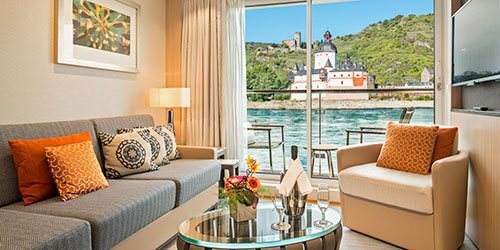 With river cruising, you can also enjoy an ever-changing mural of breathtaking scenery from your ship, so the journey itself becomes part of your discovery. For those without sea legs, river cruises have the advantage of smooth trekking, shallow waters and the gift of land that’s always in sight. Lastly, most river cruises offer inclusive value, meaning your Wi-Fi, water, alcohol and included excursions are covered in the price. However, ocean cruises tend to offer more upscale amenities, like fitness centers, multiple dining options and a variety of live entertainment. Who Would Enjoy a River Cruise? River cruises are great for everyone, especially those desiring a more relaxed and intimate form of travel. Individuals who've never stepped foot on a ship before will enjoy the relative ease of a river-bound trip with little chance of seasickness. Furthermore, with a focus on cultural exploration of locations, river cruises are perfect for those with a curiosity about art and history, or a general interest in travel. Every river is unique and each tells a different story—not only of the countries through which it flows, but also of its locks, canals, scenery and bridges. Ready to set sail? Start by browsing our selection of river cruises now! Page What is a River Cruise? | Viking River Cruises Not quite sure what a river cruise is? Discover the wonders of river cruising and the Viking experience at VikingRiverCruises.com today!